Ideal Tax Solution, LLC is prioritizing its outreach program to self-employed taxpayers who may not be aware of current IRS tax code policy and its effect on their tax liability. Self-employed taxpayers are not being afforded the benefits structured companies receive. Money spent by the self-employed on deductible items does not add profit to their bottom line. Self-employment deductions do not work the same as deductions allowed for employers. 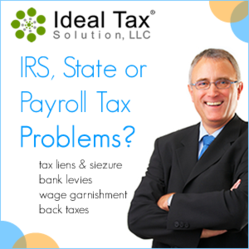 The tax liability specialists at Ideal Tax Solution are quick to point out that self-employed taxpayers in good standing do not receive the “economics of scale” from the deductions they utilize. Rather, money spent by the self-employed on deductible items does not add profit to their bottom line. Quite the opposite is true…they actually lose money on deductions. Conversely, in a corporate environment ‘efficiencies of division’ and ‘labor specialization’ create increased revenue for large companies. Self-employed taxpayers receive no tax breaks for performing the same duties and accrue no extra revenue for doing so. The reality is they actually lose money in the tax process. Addressing these and other issues related to optimizing self-employment tax responsibilities is one area of expertise in which Ideal Tax Solution can bring extensive experience to the IRS negotiating table. For tax purposes, the US government defines self-employed as being more related to employees than business owners. By IRS definition, the self-employed must play an “active role” in the operation of their business. One hundred percent of self-employed labor costs are taxed as personal income. This is a major area of discrepancy, which Ideal Tax Solution continues to address in its efforts to help self-employed entrepreneurs get a fair shake with the Internal Revenue Service.